Happy Holidays!!!! As part of this year’s holiday card exchange for French Fridays with Dorie, participants optionally included a recipe for a favorite holiday cookie, cocktail or other confection. In addition to the lovely exchange with our faraway friends, this week’s challenge is to try out any of the recipes that arrived in the mail. There were so many delicious choices, but I decide to try the Cracker Candy from Karen of Our Crazy Blessed Life and the Apple Cider Sidecar from Guyla of Clementines and Cocktails. 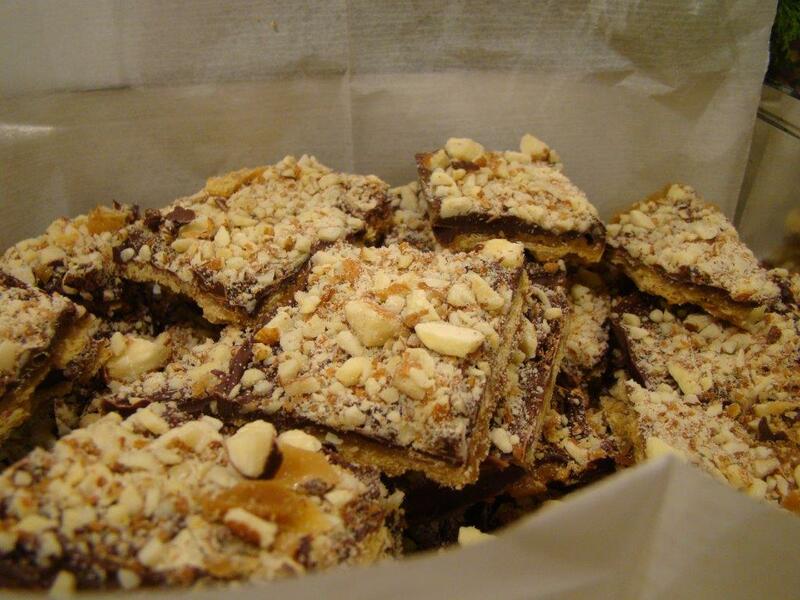 Karen’s Cracker Candy is a treat is a chocolate coated toffee confection. Her mother gave her the recipe 17 years ago, but it originally came from her grandmother. I’ve enjoyed this many times before when other people have made it, but I’ve never made it myself. I’m not sure why because it is so simple. 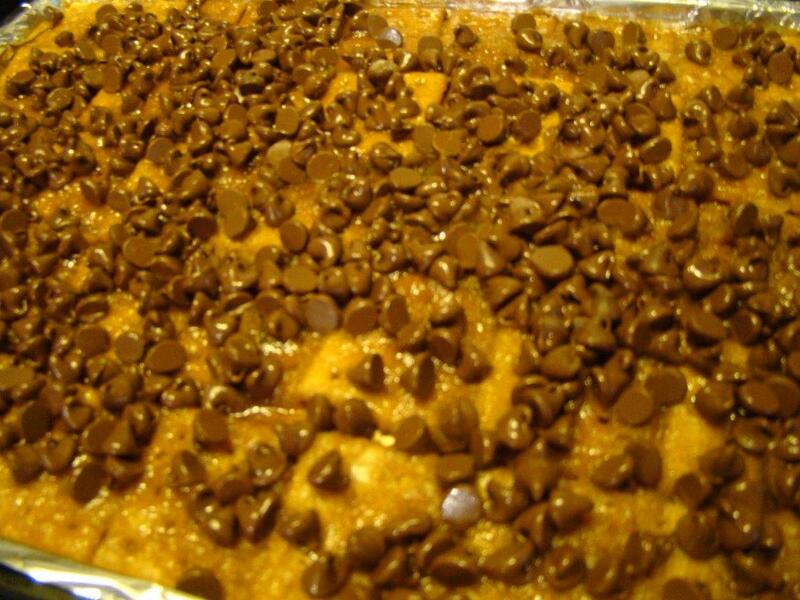 Butter and brown sugar are boiled together to make the toffee, which gets spread over the surprising base of saltine crackers and popped in the oven to make sure it saturates the crackers. Then, a bag of chocolate chips is scattered over top where the residual heat melts it. You spread the chocolate to cover the toffee. Karen’s recipe invites some tinkering on top of the chocolate, so I sprinkled a cup of finely chopped almonds on top. Once everything cools and hardens, you have an irresistible (at least to me) nibble. Preheat the oven to 400F. Place saltines side by side on a foil-covered cookie sheet. Bring the brown sugar and butter to a boil. Very important: boil for 3 minutes. Spread the mixture over crackers. Bake for 5 minutes. Sprinkle chocolate chips over the baked crackers. Let stand 5 minutes. Spread chocolate evenly. At this point, you can have some fun and sprinkle a topping like crushed peppermint, toffee bits, or sprinkles. Refrigerate until solid. Remove foil and crack into pieces. Keep refrigerated. 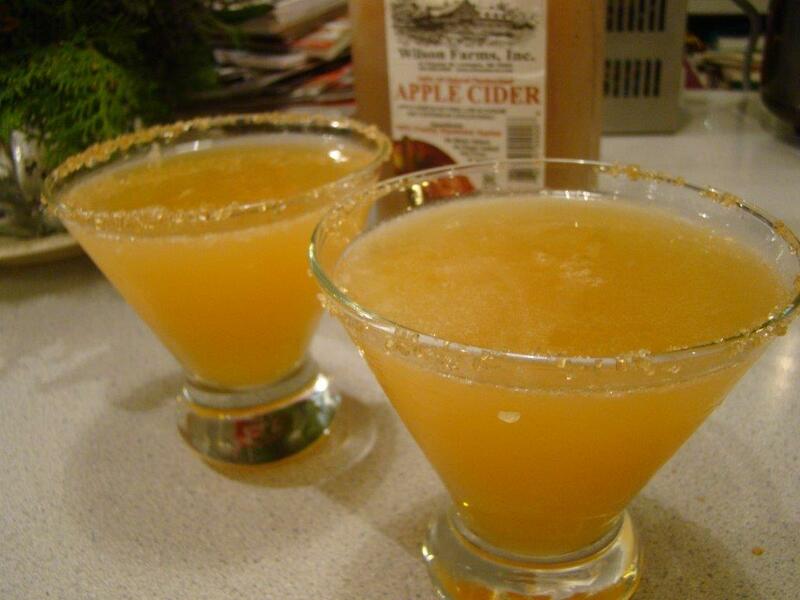 I also couldn’t resist Guyla’s festive cocktail, the Apple Cider Sidecar. It was a breeze to mix together. The fresh lemon juice and the Cointreau infused the drink with citrus flavors, tasting like a cold cup of spiked mulled cider. Cheers, Guyla! Stir together all ingredients and shake over ice. Pour into cocktail glasses that have been rimmed with raw sugar. 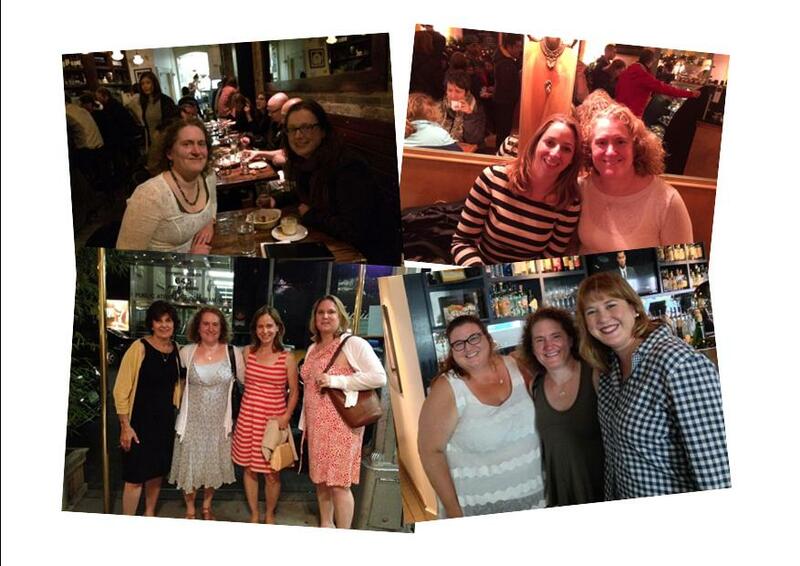 As my final French Fridays post of the year, I wanted to share a remembrance of all the meetups I had with my Dorista friends in 2014. Though unphotographed, I also saw Dorie Greenspan at her book signing at the Harvard Book Store in November. Clockwise starting from left corner: I shared dinner with Mardi of eat. live. travel. write. when she visited Boston in March, Thanksgiving weekend, I spent the afternoon with Adriana of Great Food 360. I met Susan of Create Amazing Meals and Christy of Confessions of a Culinary Diva for lunch during my Southern California vacation with Howard in June, In July, I spent the weekend in New York City with Kathy of Bakeaway with Me, Diane of Simple Living and Eating, and Cher of The not so exciting adventures of a dabbler. I am so happy about these friendships that started over food shared over the internet and have forged over meals shared in person. To see other Dorista creations for this week, check other links here. I believe it’s the little things that make the world go round. There are many people that make my life sweeter with a daily hello, a chat, a shared cup of coffee, or a walk. It’s hard to know a way that isn’t corny for showing my appreciation for brightening my year. As a result, it’s been my tradition for many years to deliver a package of holiday treats to these local friends during the holiday season, or at least, during the week between Christmas and New Year’s. My dearest friends are always on the list, but I also enjoy sharing with newer friends or acquaintances. The whole process, starting with planning what I’ll make (usually a mix of old favorites and new experiments), picking out the containers, preparing the sweets, packaging everything, and ending with stopping by to drop off the edible gifts, makes me really happy. Howard has gotten into the act as well. He’s always helped with the packaging, but a few years ago, he asked me to make similar packets of sweets to share with his colleagues at work to welcome the New Year. It’s turned into an event that we both have a lot of fun with. Initially, I think I made the same set of offerings for both rounds, but, in recent years, I mix it up, making mostly different things. Here’s the menu we shared this holiday season. I hope 2013 is full of lots of little things to brighten your life in the year ahead! Happy New Year to you!